I love getting monthly kits. new products delivered to my door and I don't have to do anything. Okay sign me up. I kept forgetting to sign up or would miss when the kits went on sale and they sell out fast! I actually saw the tweet that they were running low and quickly ordered my kit. It arrived on the 7th and it took me about 5 minutes before I was creating something with it. I knew I wanted to use the mountain and tree background dies. I then stamped a handful of images that had matching dies (only 10 of the dozens in the set have dies) I copic colored the sled and house and used the silver embossing powder from the kit for the greeting. I'm in love with it. The only thing I had trouble with in the kit was what's called a "Thick Lacquer Pen" which took me some time to figure out it's just a generic name for glossy accents. I used them to create a snow effect on the blue sky. 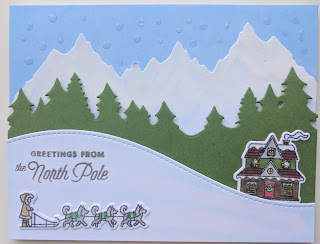 I used my Wink of Stella white glitter and Copic B00 to create a snow look on the mountains and hill.